It's funny how when you start to think about some "older" beading trend, somehow it starts to pop up again in your life! I've been talking a bit about amulet bags, and lo and behold, Interweave sent me a copy of Jean Campbell's wonderful book Beaded Bags! So, at the end of this post, I'm going to have a giveaway for you!! This is a pure project book, not for beginners. The instructions in Beaded Bags are fairly minimal, but the range of techniques is a delight—embroidery, on- and off-loom weaving, bead crochet, and bead knitting. Whether you're beading a bag for yourself or as a gift, you'll find beautiful photography, clear illustrations, and more than enough projects to inspire you for years to come. Now beaders can combine their love of handstitching and beautiful beads to make delightfully original trims and embellishments. 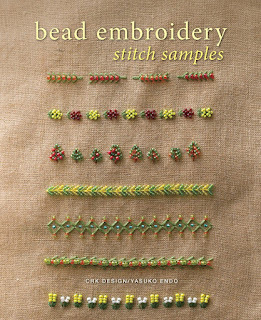 Bead Embroidery Stitch Samples shows readers how to add beads to all their favorite embroidery stitches, creating delicate details that are perfect for gifts or personal treasures. Inside, artisans will find dozens of stitch patterns that incorporate beads, ranging from elegantly simple single motifs to complex all-over patterns to three-dimensional designs. Along with step-by-step instructions are numerous examples of how the authors have added these beaded motifs to hems, pockets, cuffs, collars, and handbags, or used them as home décor trim on pillows, curtains, and lampshades. The patterns emphasize beaded edgings and trims, as opposed to heavy, solid beaded fabric motifs found in other beaded embroidery books. Artists will be inspired and charmed as they discover endless ways to make lovely patterns with beads and stitchery. With just embroidery threads and simple beads, readers will set their work apart with dazzling details and exquisite beauty. With interest in beadweaving on the rise, Mastering Peyote Stitch provides a much-needed look into the most integral technique—peyote stitch. With 15 styles in all, beading geniuses will finally have an accessible, easy-to-understand guide to one of the fundamentals of beadweaving, brought to you courtesy of Beadwork editor Melinda Barta. 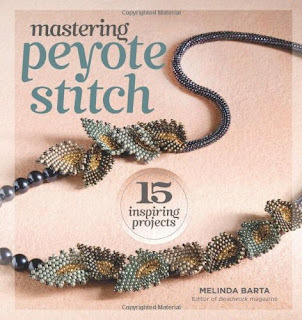 In the "Peyote Basics" chapter, readers learn the basics of creating flat peyote bands, then advance to circular and tubular variations, eventually learning to fashion dimensional jewelry pieces. Once they've mastered the basics, Melinda dives into designing dimensional jewelry pieces. Additional chapters cover combining peyote with other popular beadweaving techniques (right-angle weave, herringbone, and bead embroidery) and creating unique edgings and embellishments for finished pieces Melinda, together with Beadwork's Designers of the Year, including Jean Campbell, Lisa Kan, Carole Ohl, Melanie Potter, Jean Power, Cynthia Rutledge, and Sherry Serafini, demonstrates a range of styles in 15 beautiful jewelry projects. Thank you for the giveaway. These books look amazing. Woul love to win the book by Jean Campbell! I love to bead. I teach children, teen and adults. I teach wreath makings, jewelry and other crafts. New books will come in handy. Thank you for a chance to win. Happy Holidays !! I love beaded bags. Thanks for the giveaway! Interweave just happened to send it. "Ask and ye shall receive." Lovely.